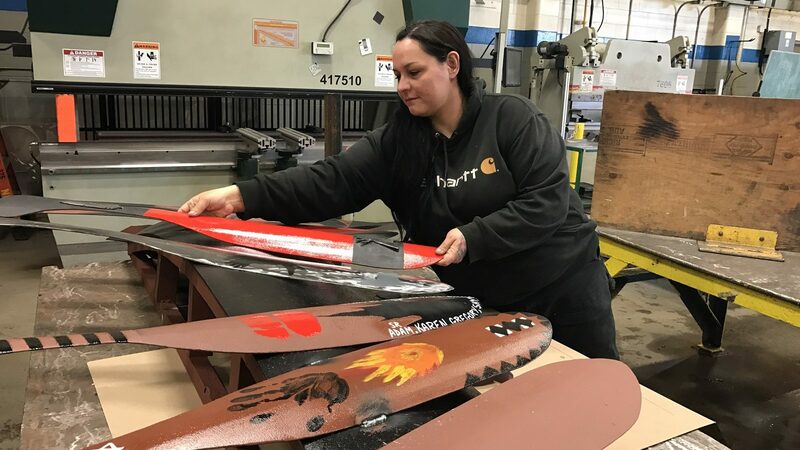 It’s her last afternoon in the BCIT Metal Fabricator Foundation program and Niki Jenkins is putting the final touches on a canoe paddle adorned with Indigenous designs. While the designs may be traditional, the paddle’s material—steel—is not. It’s Niki’s contribution to a group project—a steel canoe with accompanying paddles—her class is working on. Initiated by Steel Trades instructor Don Smith, the legacy project, as he calls it, will grace the British Columbia Institute of Technology’s Burnaby Campus for years to come. (Already in the Metal Fab yard: a steel totem.) Niki has taken the concept and run with it, exploring how she can use metal to express other traditional Aboriginal themes, such as feather headdresses. This art piece, a metal headdress created by BCIT Metal Fabricator student Niki Jenkins (pictured above), is full of subtle details not expected in a medium such as steel. Niki is part of an Indigenous cohort, a program sponsored in part by ACCESS Trades. A trained welder from Bigstone Cree Nation, Alberta, Niki finds comfort and support among her classmates. Then there’s Don Smith, her instructor. From the N’Quatqua Nation in D’Arcy, BC, Don “gets us,” Niki says. “We have common life experiences. Plus, he’s patient, super knowledgeable, and offers culturally relevant education.” The canoe is just one such project. “He wants us to leave a mark, but also provide a gift to the BCIT community,” Niki says. A single mom of two, returning to school (while balancing a part-time job as an Aboriginal Child and Youth Worker in a local School District) hasn’t been easy for Niki. She credits her family—particularly her mom, who looks after the kids, and her daughter, who will graduate from high school shortly after Niki completes the Marine Fitter program—with keeping her sane. She may have completed the Metal Fabricator Foundation program, but Niki isn’t done at BCIT. She’s already enrolled in the eight-week Marine Fitter Level 1 training, designed to prepare Metal Fabricators like Niki for work in the shipbuilding industry. 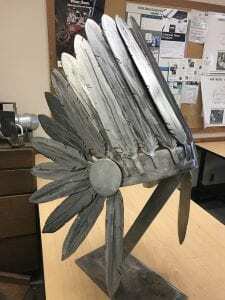 On completion, she hopes to find work as an apprentice, take some time to relax with her kids, and perhaps—if she can find the time—continue to explore metal as a medium for art.